When we called it the American Dream, what we really meant was "the American Myth." That myth convinced us that the right house/car/bank account/voting card could punch our tickets to a happily-ever-after, but for reasons too numerous and depressing to note, that myth is finally dying. Somewhere along the way, we realized the secret to mythology is not letting anyone sell it to you. You have to create your own. And now something new is springing up as we cast off the strange rules and crushing expectations of old. We're rediscovering that freedom comes from the inside out, not from the outside in. 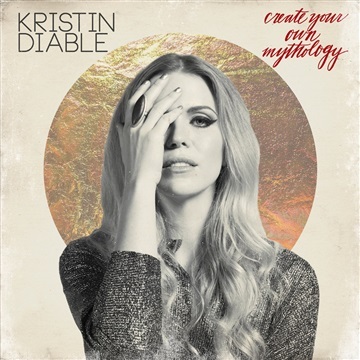 Kristin Diable has been exploring freedom and choice in her music ever since she picked up an open mic at a lounge in Baton Rouge and stunned the audience into silence. She rode that vibe, away to New York and then back to her native Louisiana like a storm front, one that shook New Orleans and cooled the air. And her newest album, Create Your Own Mythology, invokes her Louisiana and Americana roots, while firing a rock-and-roll shot across the bow of borrowed myths. Producer Dave Cobb expands upon a stellar year that had seen Sturgill Simpson's Metamodern Sounds in Country Music, Lindi Ortega's Tin Star, and Jason Isbell's Southeastern all arrive to critical acclaim--here he does double duty, producing and also standing the front lines on guitar. Cobb is known for spurring his performers to find their truest voices, and this is Diable's richest and most elaborate album to date. It takes a person to write an album, but a good album writes a person too. Kristin realized Create Your Own Mythology was fighting its way into the world during her force-of-will tour, which alighted in Europe and Africa in 2013. Cut loose from the norm, discovering new venues almost as fast as she could perform in them, she found swimming in her head new songs about holding on, letting go, patience, and faith in the face of futility. And about penning your own rules and your own reality. From the gospel notes of “True Devotion”, written in Morocco during a Ramadan sunset, to the wistful universal waters flowing through “Deepest Blue”, Diable weaves a dense, bewitching net. The idea of embracing the infinite unknown and finding freedom, clarity through the trials we experience along our journey as human beings is explored in songs like the lead single, “I’ll Make Time for You”, and “Eyes to the Horizon”. The latter has been used twice in HBO’s Treme performed by the character, Annie. Rumi wrote, "Where did I come from, and what am I supposed to be doing? I have no idea. My soul is from elsewhere, I'm sure of that, and I intend to end up there." Kristin says that music is her ticket on that journey to the soul's distant elsewhere, and this new album is her invitation to the listener--not to follow her on her mythical path, but to go questing for their own. That's a journey that will require some suffering, and acceptance, and evolution and honesty--these are the tokens hidden in these songs, smoothing that hard path, leading us away, and leading us home. it the American Dream, what we really meant was "the American Myth." The Mississippi River makes a hairpin turn in Baton Rouge before swerving unstoppably into the Gulf of Mexico. As it slowly zigs and zags like a cautious alcoholic, rich sediment sloshes loose onto the sun-baked Louisiana turf. It's lush country. Things grow here. New Orleans grew here. 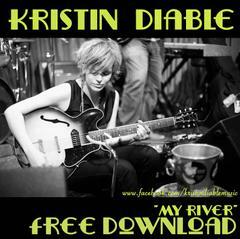 Kristin Diable grew here and is still growing. And myths grow here like sugarcane does: fast, tall, and sweet.